The Brandon and Taylor Dahley “REACHING FOR A CURE” Charity Golf Tournament held on March 28, 2009 was a HUGE success! We had 40 golfers register (less than I had hoped for but it was spring break weekend and also with the state the economy is in, we feel blessed) and everyone had a wonderful time. We served a box lunch before golf and had an awards ceremony with dinner after the tournament was finished. During the ceremony John and I spoke on our experience with SCID and why we feel newborn screening is so important. We received a standing ovation at the end…that was truly amazing! We plan to make this an annual event and we already have people signing up for next year’s tournament. So far year to date SCID, Angels for Life Foundation has raised $14,200 in donations! That is our NET value and includes donations from PayPayl (through our website), Facebook and of course the net proceeds from the golf tournament in March. I’m so proud of this accomplishment and want to thank each and every one of you who have contributed to our cause. Although the golf tournament is over, the fundraising efforts continue on. 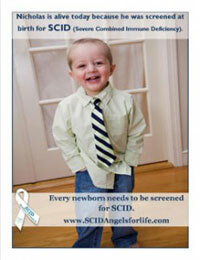 So does the need for newborn Screening for SCID, education and awareness of this “rarely diagnosed” disease. SCID, Angels for Life Foundation is a 501 (C)(3) and your donation is tax deductible. We realize everyone’s financial circumstances are different and we hope you will donate an amount that is financially comfortable for you. If you haven’t given already, please consider giving now, every dollar counts. Thank you!! !